Shooting in the Woods: He made it out alone! Dad told us that while he was scoping out a deer, he was shot by a young lad first time out hunting. The lad ran off leaving my dad bleeding from his [right] hand. Dad found his way out of the woods. If he told us how, I don’t remember. He made it to the hospital. He had surgery on his hand. [More about that surgery in another blog] He was told he would never use that hand again. They didn’t know my father. He learned how to use it. He became a mechanic and what he called himself a “Jack of All Trades.” He continued hunting, teaching others how to hunt safely [bright colors a must in the woods,] doing what ever needed to be done. I found one of the articles I was searching for in regards to shooting listed on Genelaogy Bank. I used the search “Nelson Stearns” exact in their data base. It show 715 archives results. I narrowed the search by adding the years 1930-1988 showing 22 newspaper articles and 7 probate result. The 15th article was about a young boy of 19 years being faced with charges of abandoning a man he shot in a hunting accident. I now know the name of the man my father always said he felt sorry for, Louis M. Putney from Willow St., Waltham, Massachusetts. Dad mentioned that the young man must be badly traumatized for accidentally shooting a person while hunting. He hoped the young man learn the importance of hunting safely; would return to hunting. It would be a sad thing if he didn’t. My father was a forgiving man. He never held any ill feeling towards that young man. A conservation officer said Putney left the scene of the accident yesterday in woods on Sutton, N.H. [New Hampshire,] without aiding Nelson Stearns, 26, of Sutton Mills. 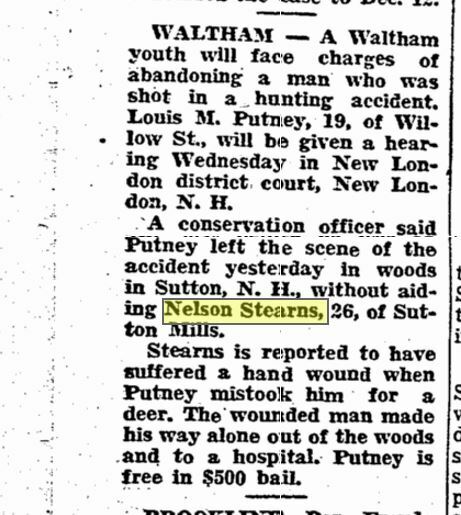 Stearns is reported to have suffered a hand wound when Putney mistook him for a deer. The wounded man made his way alone out of the woods and to a hospital. Putney is free in $500 bail. 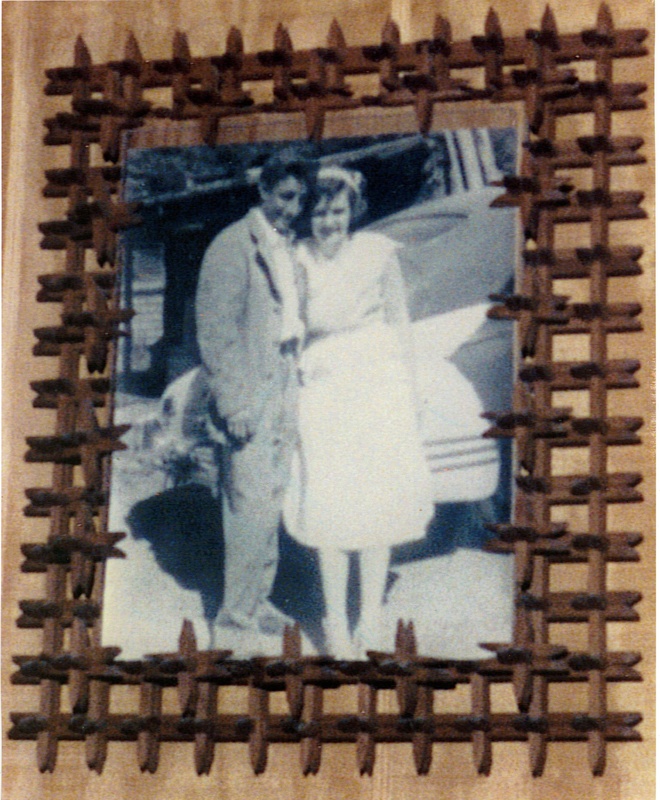 “Our Town, Monday, December 5, 1955,” Boston Traveler (Boston, Massachusetts), electronic newspaper, archived, (http://genealogybank.com: accessed 27 Jan 2016), p. 43, col. 1, para. 4.